GRP roof walkways from GripClad reduce the possibilities of accidents when walking on high structures. Our non-slip roof access walkways provide reliable and safe transit through maintenance access areas. In areas such as roofs that are exposed to the elements, you need a walking surface that is robust and reliable. Our GRP roof walkways are a modern alternative for wooden roof duckboards, catwalks or metal sheeting. In addition to providing the highest standards of safety, GRP roof walkways from GripClad are durable and chemical, water and UV resistant. This makes them ideal for prolonged outdoor use. GRP anti-slip grating is an ideal walking surface for flat roofs of all types, including standing seam or corrugated roofs. Where regular access is needed for maintenance, inspections, air quality monitoring, skylight cleaning etc., GRP walkways distribute the load evenly on to the roof, reducing wear and tear on the flat roof membranes. GRP anti-slip roof crawling boards offer excellent safety standards with minimal maintenance. GripClad offers a lightweight, practical solution that is easily installed to replace existing wooden duckboards and scaffolding boards. Ice, moss and rain can cause slipping hazards to personnel working on the roof. Roof panels or corrugated sheets also present a hazard, both on pitched and flat roofs. GRP roof walkways and crawl boards from GripClad provide a safe and secure walking surface. Thanks to its lightweight construction and modular design, installing and maintaining GRP rooftop walkways is easy for maintenance crews. The superior resistance properties of glass reinforced plastic mean that it stands up well to the elements. This means that inspections and maintenance rarely need to be undertaken, allowing you to focus on looking after the roof itself. BS EN 516:2006 requires walkways to be tested with a load of 1.5Kn over an area 100mm sq and deflection kept within 15 mm or 1/100 of the span, whichever is lesser. The load is then to be increased to 2.6Kn and held for a minute. 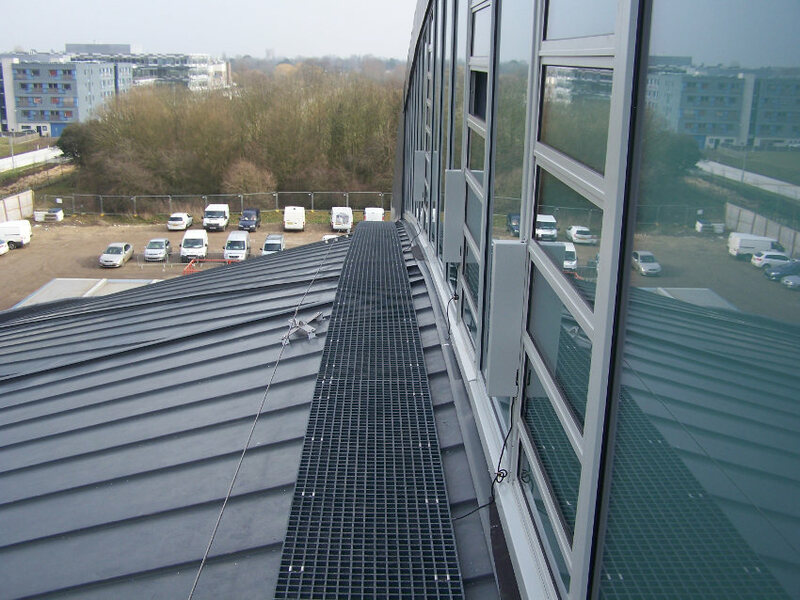 All of our GRP roof walkway solutions are more flexible and lighter than wood or metal alternatives. They are compliant with all requirements and provide the perfect combination of lightness and safety.